Disclaimer: If you are a couponer, do not take offense at this post. I am simply sharing my experience with what is available in our area that matches up with the coupons in our circulars. I am not criticizing anyone who coupons and hope to show a different viewpoint only. Finally heading out for a day long (I kid you not) shopping trip hopping from store to store to snag the best deals. I had intricate lists and strict budgets per store. I had a price book and an inventory sheet of what we had at home in case I stumbled upon an unadvertised special. It was time-consuming and exhausting, but hey I was saving money…right? Most of my purchases were for processed and sometimes empty calorie foods. My freezer was filled with frozen meals, chicken nuggets, pizzas, hotdogs, and ice cream sandwiches. My pantry filled with pop tarts, high sugar cereals cookies, chips, and cakes. I was spending so much time focusing on the deals I wasn’t focusing on our dietary needs. Bananas seemed to be the only fresh fruit in the house and we rarely had fresh veggies since I had so many bags of frozen in my freezer (only .19 after a coupon mind you) My fridge was bare except for condiments and drinks. Sometimes a girl just craves a bowl of grapes! One day I was on Pinterest (one of my favorite past times) and was looking at recipes. The dishes were beautiful! The colors were amazing and the food looked so delicious, nothing like the dinners I presented my poor family with each night. Recipe after recipe called for the same thing…fresh produce. It also said I needed to use something called a stove. It had been quite a while since I used my stove since everything we bought was microwavable. I then took a step back and reevaluated my shopping method. Was all this work worth the amount of money I was saving? Was I purchasing foods that my family would eat? Was the food they would eat benefiting them nutritionally? Was I actually SAVING money? The answers were no, no and no. So before my next shopping trip, I made a list of our favorite meals. I asked everyone what their favorite foods were to snack on and what fruits and veggies they enjoyed. 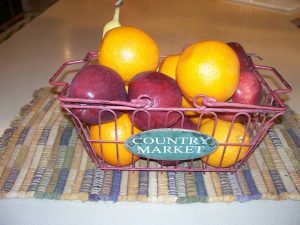 I researched our local stores to find the best selection of fresh foods with the best prices. I created a price book and kept it with me when I shopped. This ensured I was always getting the best deal. I prepared a brand new list and off I went. The first few trips I must admit were a bit expensive and our budget did take a hit. But like anything new, it takes time to come up with a system. I did find, however, since my list was no longer being driven by what coupons I had I was more able to focus on our weekly menu and list. I found it much easier to stay on budget and not hoard food specials filling my house with items our family simply would not and should not eat. Today I only shop 4 stores. One is known for its locally purchased produce, the second is a discount store for shelf and freezer items, the third is the local Mennonite store for my spices, honey and hard to find items, and fourth is my bulk store for everything else. My errand day takes just the morning. My fridge is no longer empty, but overflowing with produce. On my counter sits a gorgeous fruit bowl and my pantry is filled with baking supplies and mixes. My family now sits down to fresh cooked colorful meals that are delicious, nutritious and all budget friendly. All in all, we are thrilled with the change. When living on a budget sometimes you need to step back and reevaluate what you are doing. Ask yourself if the task is worth your time and if the benefits are worth the effort to save a few dollars. Is your cost per hour a good trade off for the money you save performing a frugal task? If the answer is no, it is time to make a change. Or at the very least time to do some tweaking. I hope that makes cents! Looking for more? You can find all of my Money Saving Tips here! I really liked this article. AND I too had a food epiphany but regarding a well-known diet program. Ordered the food, ate the food, did fairly well but the “food” was all frozen and/or microwavable CRAP. Gave what I had left away. Eating fresh and doing just as well. You get what you pay for in the end. I just love that you got rid of your microwave! What a great way to ensure you eat a more “real food” diet. Simple living means simple eating as well! There is nothing wrong with frozen fruits and veggies. They are as good as fresh. I live in Canada and we are unable to “extreme coupon” here. Even if you buy stuff and give 1/2 to a food bank, shelter or church you can eliminate throwing out food before the expiry date. Stocking up on dish soap, cleaning products and the like can save you money. Just check out the expiry dates before you buy and estimate how long it would take you to use the stuff. again, donating toothpastes, toothbrushes and whatever you can give is a great thing! Keep up the good work! 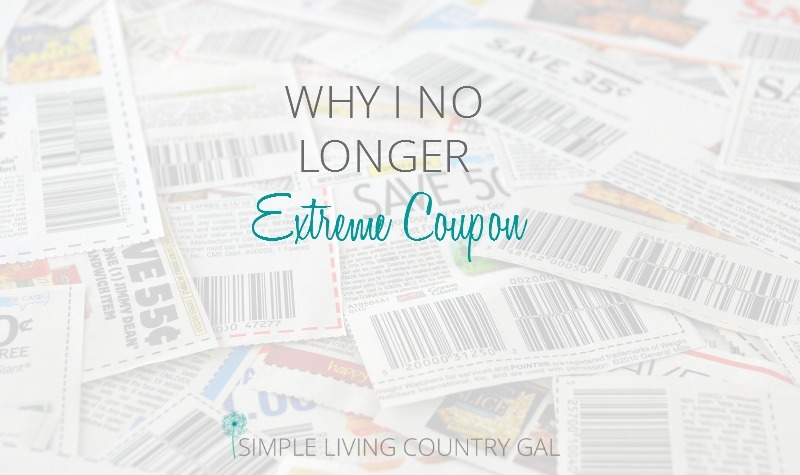 I also loved your idea, but on the other hand, I have often wondered if I could learn to extreme coupon, but I am not that good at a lot of things, I had a series of mini strokes 2yrs ago and it left me unable to use my left arm, so I just assumed that as long as it takes to prepare for a grocery store shopping trip that I wouldn’t make it. Heck, by the time I get all the coupons clipped I believe that the coupons would expire before I made it to the store. JK the good Lord has truly blessed me!! I did however, wrap about 10 gifts this morning, I am helping my neice buy Christmas for her 5 children as her mom is no longer with us. So I stepped in this year to buy Christmas in my sister’s honor. But most people probably couldn’t wrap one gift, nonetheless two. I came to a similar realization a couple of years ago. We had so much “food” in our house, but none of it good for us. I felt like I couldn’t pass up the deals because they were so cheap, or even free. But as you said it just took so much time, and shopping became miserable because my lists were so complicated. I still coupon, but now mostly just shop sales and use printable coupons. I still save us a lot of money, but don’t have to spend my whole day doing it. 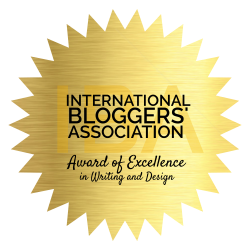 Thanks for sharing your perspective! Yes, that was my household to a “T”. I love online coupons but lately have been trying my hand at the phone coupons to save a bit more money. Printer ink can be quite expensive!